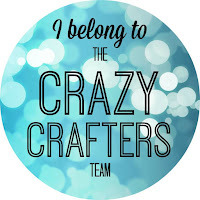 This card has been included in the Crazy Crafters Team Project Highlight on Kylie Bertucci's blog. If you like this card, you can vote for it there - but beware, you'll also find lots of other beautiful cards from other Crazy Crafter team members to look at and find inspiration! Click on the header above to visit the Team Project highlight. This is how I used the off-cut from the black layer of this card. Off-cuts from the Sunburst Thinlit Die put to good use! Using the same method that I described in this post, I layered the off-cut onto a pre-cut piece of Perfectly Artistic Designer Series paper and then onto a layer of Basic Black Cardstock before adhering to my So Saffron card. With black ink, I stamped the greeting from the Happy Notes stamp set and then cut it with a Lots of Labels framelit which I adhered to a Basic Black layer but with a larger framelit. I cut some flowers with the Botanical Builder Framelits from Crushed Curry and Basic Black cardstock, curled the petals a little and sponged the edges of the yellow petals with black ink. I stuck everything onto the front of the card and added a few Rhinestone Jewels. I also added a little bit of Wink of Stella to yellow petals for a bit of glamour. A touch of Wink of Stella for a touch of glamour! That's it! So quick and easy!